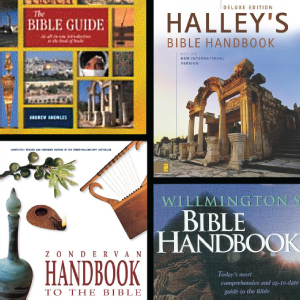 Bible handbooks are like a roadmap to reading the Bible. Passage summaries, detailed maps, and character sketches provide context for each biblical account. Using Bible handbooks we find that David was called mashiach (“anointed”; “messiah”) and found favor with God before his victory over Goliath. Andrew Knowles, The Bible Guide (Minneapolis: Augsburg, 2001) pg. 138. In the Valley of Elah, Goliath taunted David’s small stature and feeble weaponry. David’s bravery was unimpeded by Goliath’s words and fierce appearance. He knew Goliath’s defeat would prove to the nations “that there is a God in Israel” (1 Sam 17:46 ESV). David’s pronouncement seems trite to us, but for David and the young nation of Israel, Goliath’s defeat demonstrated the power of the God of Israel over every nation and its god. When David announced these words, he proclaimed the favor and presence of Yahweh, the supreme God of Israel. Henry H. Halley, Halley’s Bible Handbook (Grand Rapids: Zondervan, 2007), pg. 209. Samuel anointed David in secret so that Saul would not know about the young shepherd-king from Bethlehem. God was committed to training David to be Israel’s king. David’s fame as a musician earned him the position of armor-bearer to King Saul. David’s close association with the king’s counselors and his friendship with Saul’s son, Jonathan, prepared him to be King of Israel; but his tangle with the Philistine giant would earn him the people’s favor and support. This 2007 revision of Halley’s adds a substantial number of archaeological notes (e.g., The Tel Dan Inscription is mentioned in reference to 2 Sam 7 on pg. 125). H. L. Willmington’s Bible Handbook (Wheaton: Tyndale House, 1997), pg. 154. In 1 Sam 16:13, the prophet Samuel publicly anointed Israel’s newest messiah, David. Willmington explores the usage of the Hebrew word for “anointed one” or “christ” (mashiach, משׁיח; English, “messiah”). The word is used to describe Old Testament figures chosen to do God’s work (e.g., Saul in 1 Sam 24:10; David in 2 Sam 19:21; and even the Persian King Cyrus in Isa 45:1). God overlooked seven of Jesse’s sons and selected David to be Saul’s successor. God was not concerned with David’s physical stature, but with his spiritual stability. David Barton, Zondervan Handbook to the Bible (Grand Rapids: Zondervan, 1999), pgs. 269–71. David Barton’s character sketch illustrates our connection to David. From his battle with Goliath, to his flight from Saul, to the deterioration of his family, David is portrayed as the underdog. Whether he is mourning the loss of Saul and Jonathan or weeping over adulterous sin, we find humanity at the helm of a nation. Each event in David’s life points to his dependence on God and God’s sovereignty over the young nation of Israel. The story of David is not a fairy tale or a bedtime story. David’s life reminds us of God’s faithfulness to His cause and His people. Through David’s struggles and victories, we learn how to mourn in the presence of our Heavenly Father and praise Him for His providence.